The solitaire palm, or Ptychosperma elegans, is a palm tree of moderate size that can be grown either in the yard or in a spacious house. 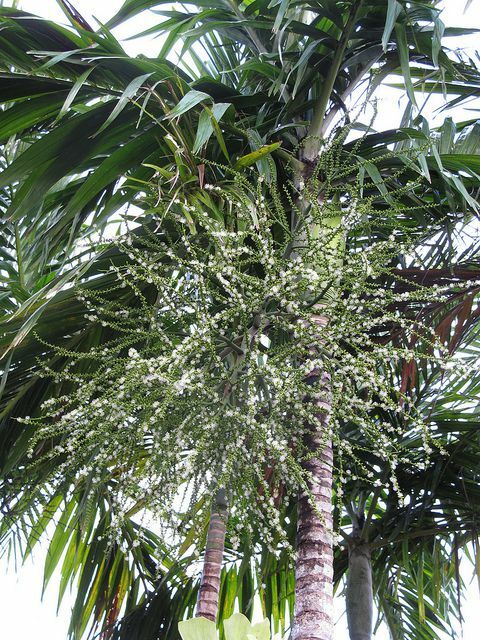 Native to Australia, this palm has become quite popular in South Florida and grows well in tropical conditions. Its name is derived from its growth habit: it grows only one trunk, unlike multiple-trunk palm trees. This is a sleek, narrow palm that can fit into tight spaces – though it can reach a maximum of about twenty-five feet in the right conditions, in practice many gardeners grow them inside at a level around ten feet. Its trunk is fairly slim and encircled by gray rings, and its compound dark green leaves grow to about six feet long. Beneath the palm’s crown shaft, it grows inflorescences of a few feet long that develop pleasant white flowers and bunches of bright red fruit. A moderate grower, the solitaire palm doesn’t need as much light and heat as many other palms and can thrive in partial shade. Several seedlings can be planted in the same pot, which creates an attractive spread as they grow away from each other. Consider growing the solitaire palm in a landscape or as a container plant, especially if you live in the tropical conditions it prefers. Light: Full to the dappled sun is best, although like all palms the Pytchosperma should receive lots of light. Water: The solitaire palm should be regularly watered, although once mature it is fairly drought-tolerant and hardy. Temperature: Warm tropical temperatures. The palm is not frost resistant. Soil: Organically rich soil with good drainage is best, and any decent potting soil mix should do just fine should you choose to grow these in containers. Fertilizer: When grown inside, the solitaire palm doesn’t need too much fertilizer since its growth is already slightly slowed. Fertilize judiciously and make sure not to use too much, as you can damage the plant’s roots. Three times a year—once in fall, once in summer, once in spring—should keep the plant green and healthy. Solitaire palms can be propagated by seed germination, and its seeds should be available at most tropical nurseries or online. Be patient and water regularly: its seeds develop fairly slowly. It can also propagate by cuttings: remove a side shoot with the beginnings of roots and replant in the potting soil mix. As with most palms, the solitaire palm doesn’t generally need to be repotted often. Palm trees usually can grow well even with their root systems fairly cramped, unlike most plants. Nonetheless, the solitaire palm may need to be repotted if it outgrows its pot. It can break through a plastic pot; many gardeners plant these in plastic pots when they’re young, then repot in a bigger ceramic pot once they break through. When repotting, lift the entire root system at once—their roots are easily damaged. The solitaire palm is closely related to many other Australian Ptychospermas, particularly other palms like the Ptychosperma macarthurii. It is also often mistaken for the Alexander palm, or Archontophoenix alexandrae, a closely related but much larger palm which it resembles. The solitaire palm is a fairly low-maintenance plant. It is self-cleaning, which means that its dead and decaying branches fall off by themselves, and it doesn’t have significant fertilization requirements. It does need regular water, warm temperatures, and enough light to survive, but for a palm tree, its light requirements are fairly low. If you have the space to accommodate it, the solitaire palm can perform well either in landscapes or as a potted houseplant.